Graham Hancock’s multi-million bestseller Fingerprints of the Gods remains an astonishing, deeply controversial, wide-ranging investigation of the mysteries of our past and the evidence for Earth’s lost civilization. 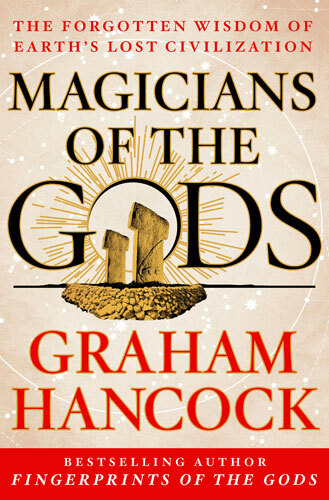 Twenty years on, Hancock returns with Magicians of the Gods, the sequel to his seminal work. Published on 10 September 2015 in the UK and on 10 November 2015 in the US, Magicians of the Gods is not in any sense an ‘update’ of Fingerprints but is a completely new book filled from front to back with completely new evidence, completely new travels to the world’s most mysterious archaeological sites, and completely new insights, based on the latest scientific evidence, into the global cataclysm that wiped an advanced civilization from the earth and made us a species with amnesia, forced to begin again like children with no memory of what went before. George Howard, Editor of Cosmic Tusk, tells it as he sees it about attempts by some scientists to suppress the truth of the comet that hit the North American ice-cap around 12,800 years ago at the end of the last Ice Age, sparking off a worldwide cataclysm.